Red lentils salad is something that I have tried just twice and I am hooked. Tasty and yet simple to make, use ingredients in your pantry and get a protein-packed a healthy vegetarian salad. Eat lentils as, lentils help in lowering cholesterol and hence you will end up with a healthier heart. 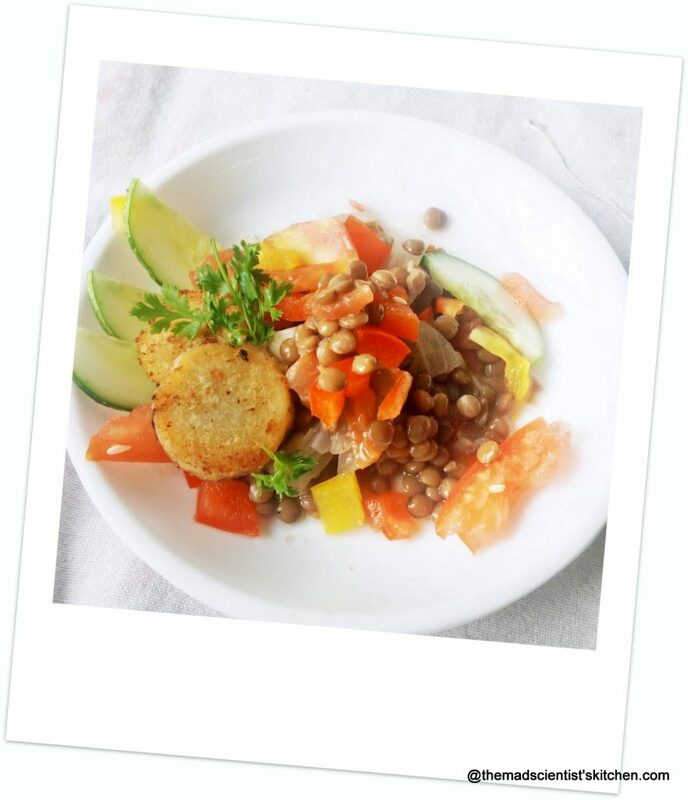 Since lentils have both soluble and insoluble fibre, your blood sugar and intestine both, get a helping hand. Want to increase energy? Want to lose weight? Introduce lentils in your diet. It was not simply that our ancestors insisted on a big katori of dal with every meal. Lentils have the capacity to give you all of them. My kids are not dal fans they prefer salads so you will agree this is a great way to feed them any kind of lentils, beans, both sources of proteins. I buy red lentils regularly as cooking them does not need pre-planning, 20 minutes of soaking time is enough. My maid cooks them in the open pan without soaking them. These lentils also called masoor, or akha masoor I have used in the past to make Sprouted Masoor Salad, Masoor Biryani| Whole Red Lentil Biryani, Ridge Gourd and Masoor Dal Vegetable, at least once a month I make tonak out of masoor. But like they say ghar ki murgi…. I have not posted it here. Will definitely post as soon as possible. As for Salads here are a few that we love Watermelon and Feta Salad with Micro Greens, Pasta Salad and Stir fried Mushrooms with Bread Sauce(?? ), Cabbage Salad Indian Style, Simple but Yummy Quinoa Salad. Here is round-up of the event Kid Friendly Soups and Salads that I had hosted. The salad can be eaten as a salad with bread on the side. We had it with the Goan Poli. Else with a little more of the liquid in which you boil the lentils mash them and serve them as a plain gravy with a spicy pulao. 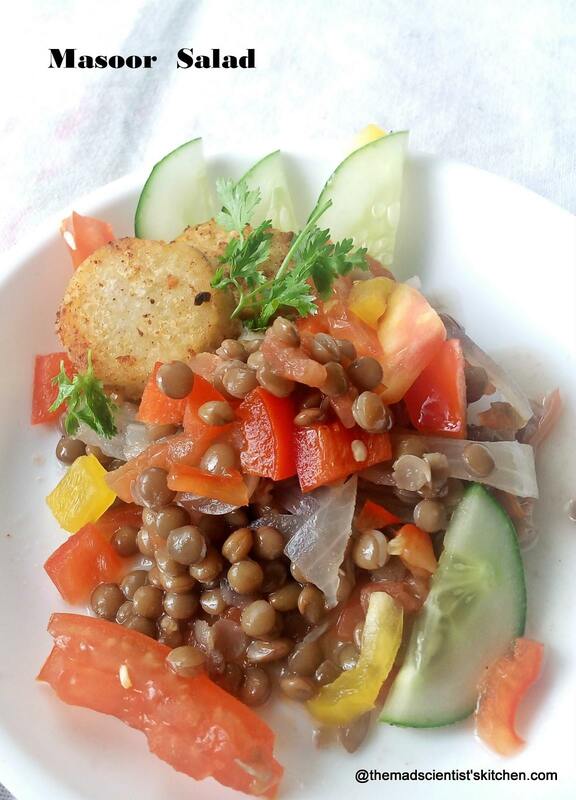 Masoor salads main ingredients are whole red lentils, onions, tomatoes, capsicum, cucumber and taro root. 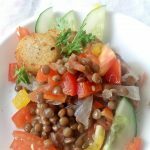 Red Lentil Salad is a simple salad that can double up as a meal or even a soup! In a pan add the lentils, onions, tomatoes chopped, garlic and water bring to a boil and cook till lentils are just done. Meanwhile in another pan add the washed arbi roots add some tamarind and salt to the pan. Mix well and add water to cover all the roots and let it boil until the knife pierced in the root cuts through without any resistance. Remove the roots from the pan and let them cool completely. Peel and slice the roots. In a non-stick pan add a little oil arrange the slices in the oil, sprinkle same chilli power, a pinch of salt and fry till light golden, flip and fry the other side. Drain and set aside. Mix all the ingredients together in a big bowl. Add salt if needed serve immediately. The arbi, also known as taro roots can be substituted with sweet potato or potato. Awesome..such a lovely salad. I am hooked on on these salads and need to try them all. The masoor one is beautifully plated and is tempting me to try it asap. This is such a hearty salad and when served with bread this must be totally yum. 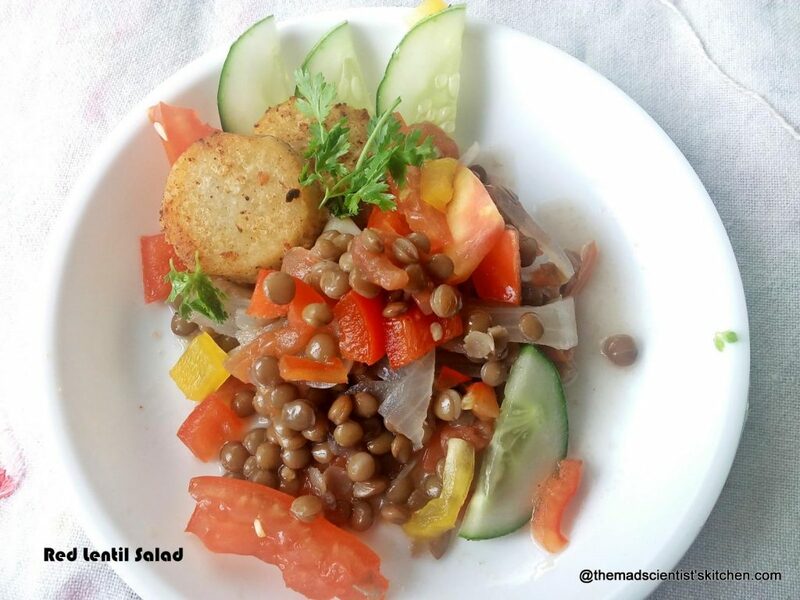 Best way to serve kids lentils..
That’s super looking plate of salad Arch, I was thinking that was aloo, nice to know its taro..the salad looks so easy to assemble.. The salad looks so inviting. Never tried the combination of arbi itch red lentils. Sounds interesting. Masoor in the salad sounds super filling and tasty dish to have for lunch or dinner. The salad with the arbi pieces looks so tempting Archana. Super Salad! This salad is definitely my kind of food, wow and those arbi slices makes this nutritious salad more attractive. Never used red lentil in salad, looks so inviting and healthy. I also don’t soak masoor dal. I have also become a big fan of this dal, especially of the whole masoor dal. It’s delicious in all the recipes I have tried. But never tried it ina salad though. Btw the plating of the salad is very nice. It Looks really like a high end serving in a 5 star restaurant :-). wow, thanks, Rajani and this is a mobile pic. Makes me wonder if did need the camera I paid so much for? I love the whole masoor dal and a salad with this sounds interesting. Never included arbi in the salad. Got to try that combo as well. Such a healthy and filling salad.As Rajani said playing is so neatly done and picture looks perfect.